Daily Turismo: MotoExotica Checkerboard Alfa Spider Riddler back for sale? MotoExotica Checkerboard Alfa Spider Riddler back for sale? 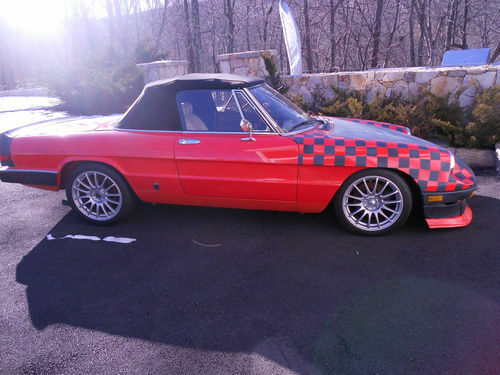 We featured a 1985 Alfa Romeo Spider with a seriously horrible paint scheme late last year for sale in St Louis, MO from the guys at MotoExotica. Cars coming back up for sale isn't unusual, but this one is striking and going through owners like a rabid pit bull. The current seller is in Connecticut and claims to have purchased it from Jim Norton Toyota in Oklahoma. See it here on ebay, with no bids at $3,999 with 1 day to go.